Attending a Hawaiian luau is a unique opportunity to witness beautiful Hawaiian culture and traditions come together in a mix of dances, dress, storytelling, and feasting that provides a lovely experience for every Hawaiian visitor. In its simplest form, a luau is a Hawaiian party where a group of people gather to feast and to celebrate an event. Today, a luau may celebrate a milestone such as a wedding, graduation, or birthday. However, in ancient times luaus were held in order to observe a victory in battle, a bountiful harvest, or the like. A key component of the luau is the dance, or hula; an intricate art form whereby body movements are accompanied by chants or songs and tell the story of anything from swaying trees to emotions such as yearning. The hula is much more than just a dance- it’s a fundamental part of Hawaiian culture that has significant meaning to the Hawaiian people. Before contact with the West, native Hawaiians celebrated important achievements with friends and family and these gatherings were meant to unite the participants. Called ‘aha‘aina, these celebrations were rich with symbolism; some foods served represented strength while others represented goals or virtues the attendees hoped to achieve. Many of the foods were off limits to women and commoners- such as pork and bananas- and were reserved for royalty. Men and women also dined separately during the meal. King Kamehameha II ended traditional religious practices in 1819 and feasted with women to commemorate the occasion and signify major changes in society. Shortly thereafter, the term luau began to replace ‘aha’aina. Note that luau is actually the name of the taro leaf, which is cooked like spinach when it is young and tender. Those attending the luau sat on woven hala tree leaf mats and enjoyed a variety of foods such as poi (made from the corm of the taro plant), pork, fish, sweet potatoes, and bananas. The meal was eaten with one’s fingers. These luaus were very large affairs and it was not uncommon for hundreds or even a thousand people to attend. In modern times, private luaus are still very special occasions where milestones and accomplishments are celebrated. And Hawaii also welcomes a seemingly infinite number of people to its many luaus held around the island. Although some luaus are more traditional than others, one thing remains the same: when you’re at a luau, you are ohana (family). What Can I Expect at a Hawaiian Luau? In a nutshell- sheer enjoyment! But let’s get a little more specific so you’ll know how things will likely unfold. Your luau may begin with a traditional lei greeting, where attendees receive either a flower or kukui nut lei as a sign of affection and to welcome the visitor to the event. Please note that out of respect a lei should always be accepted. The proper way to wear a lei is to drape it gently over the shoulders so it hangs down both in front and back. Also, it is considered rude to remove the lei in front of the person who gave it to you. If you absolutely must remove it, please be very discreet. Before the meal begins, many luaus hold an imu ceremony. An imu is an underground oven that uses hot coals, layers of leaves and/or cloth, and stones to steam the main dish, usually the kalua pork. The ceremony consists of removing the layers of cloth and leaves to reveal the food, so guests can see this fascinating cooking process before the pork is shredded and served. Check with your particular luau, but as a general rule drinks are included in the luau price. Some may offer a full open bar while others limit the offerings to some iconic tropical drinks. Usually after dinner (but sometimes during), you will be mesmerized with traditional hula dancing and storytelling. The dancers will wear Hawaiian/Polynesian luau dancer attire and their dances will be accompanied with music and/or Hawaiian chants. If you’re fortunate, your luau will end with a traditional Samoan fire knife dance, a thrilling spectacle that will surely get your heart pumping! Pig freshly removed from underground pit. Kailua style pig is a staple of the luau. What Should I Wear at a Hawaiian Luau? Think dressy casual meets comfort. You want to be relaxed and presentable, so ladies: Think casual sundresses, nice shorts, breathable pants or capris, and a nice top. Gentlemen often choose nice khaki shorts or loose-fitting chinos or linen pants with an Aloha shirt or other similar top. Dressier flip flops and sandals are fine for both men and women, as are casual slip ons. Remember that you may be beachside, so consider this when choosing footwear. You may also want to take a light sweater or jacket, as evenings can get a bit chilly. Do you need other packing suggestions? Find our list here. Keep in mind that if you are attending a luau, whether a private gathering hosted by Hawaiians or one open to the general public, such as those we feature here, that you should always display the utmost respect for Hawaiian culture. Accept the lei and respect the spirit in which it was given (see above). Try all of the dishes offered at a luau. These foods are all culturally significant and trying them shows you are open to your hosts’ culture. Plus, everything is delicious! If there is something you see you do not understand, either at the luau or in another setting, humbly ask for clarification and don’t assume you know how to interpret what you are seeing. Make an attempt to learn some Hawaiian words before you go. However, please be mindful and respectful of when and if you choose to use them. Don’t try to “talk like a local”, so to speak. Where are the Best Luaus? 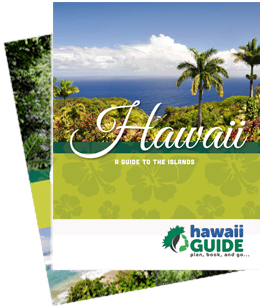 Right here on Hawaii Guide! Each island has a wonderful selection of luaus and we have handpicked the only very best for you. Check out our island-by-island luau guide and book yours today. One last note about respect; and please, we cannot emphasize this enough: Unless you are Hawaiian or are very intimately familiar with the culture, do not throw or attend a party deemed a “luau.” Culture is an identity- not a party theme. Traditional forms of dress associated with a luau and the sacred hula dance are just that- sacred. If you are not Hawaiian, the culture is not yours for appropriation or purchase, ever.